Earlier in the year, I had written a series on asset allocation. This series included the details of the asset allocation on my retirement account. My goal was to provide quarterly updates regarding my retirement account performance. However, I couldn’t get to it sooner. My goal is to re-balance portfolio on a quarterly basis if required. Basically, if the drift from targeted asset allocation is greater than 3% for any particular asset class that would trigger me to do a re-balance. I should say I got lucky – sometime September or October of last year, I rolled over my 401k from my former employer into a Rollover IRA. This money was sitting as cash. When there was a market dip in Jan 2016, I started investing into the market all the way through Feb 2016. This helped me get ahead a little bit as the market recovered from Jan 2016 lows. As I always say, the best time to dive into the market is when there is a dip, especially if your retirement is 20+ years away. A thing to note is that I follow the age based asset allocation rule of thumb – my age would match the bond allocation, and the stock allocation would be 100 minus my age. Currently, I have set the stock vs. bond allocation to 60% stocks and 40% bonds. Year to date, you can see that the drift per individual investment is less than 3% from the targeted allocation. The overall stock vs. bond split as it stands today is 62% stocks and 38% bonds. Hence, it did not trigger any portfolio re-balancing. Okay let us take a look at each of the funds in my retirement portfolio, see how they performed year-to-date, and also how my account performed overall. I have also included S&P 500 index as a benchmark. Overall, I a happy camper. As I mentioned, I got lucky and had the money in my retirement account sitting as cash while the market experienced a dip in Jan 2016 and I took advantage of it. How do you track your retirement account performance? How often do you re-balance your portfolio? 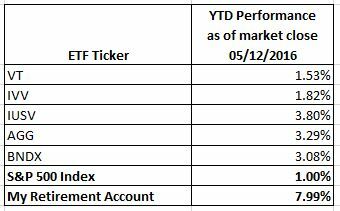 Do you have any feedback on the choices of ETFs I have in my retirement portfolio?